With no winters to destroy unwanted pests and diseases, soil bound insects will eat the roots of western vegetables and multiply unchecked and attack the valuable crop. 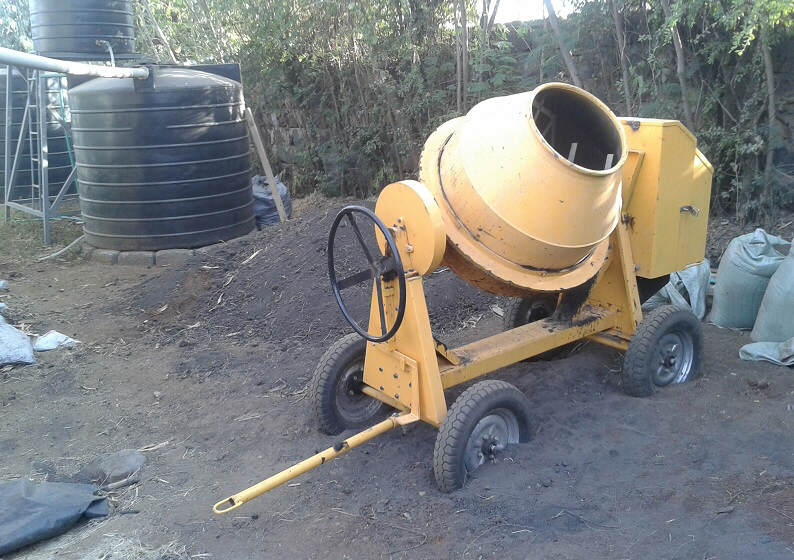 This can be solved by mixing different types of earth using clay, sandy and silty soils and then steam cleaning the mixture. 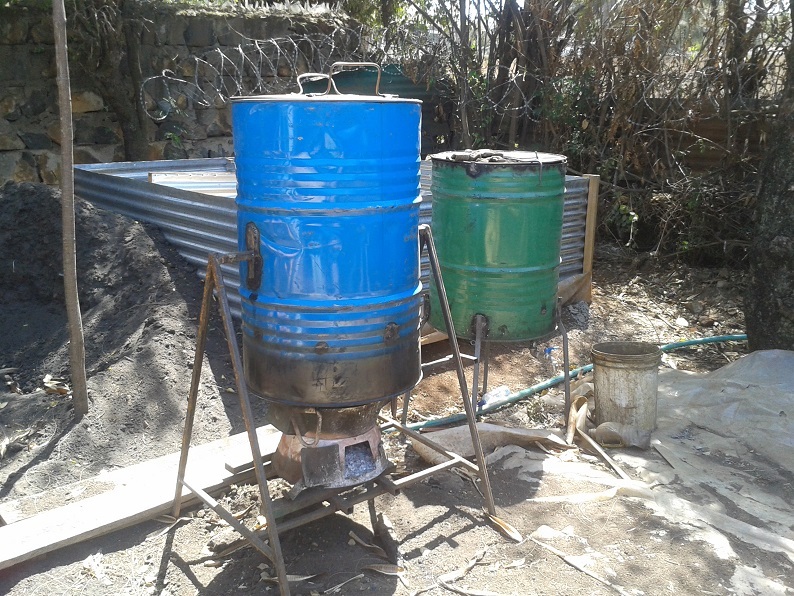 The picture below shows the steamer and a liquid fertilizer distiller with a compost chamber in the rear. 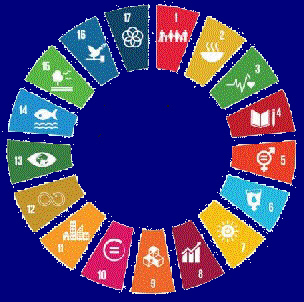 At least 17 elements are essential nutrients for plant growth; nine of these are needed in relatively large amounts and are known as macronutrients, the rest are called micronutrients. Three of these macronutrients (carbon, oxygen and hydrogen) are obtained from air and water; the rest are obtained from soil. Soil nutrients can limit plant growth if they are not available in sufficient quantity, ratio, or correct form. Carbon (C) Forms the backbone of most plant molecules, including carbohydrates, proteins and cellulose. Carbon is fixed from carbon dioxide in the air through photosynthesis. Hydrogen (H) Is also a major component of carbohydrates and other plant molecules, it is obtained mostly from water. Oxygen (O) Is a component of many plant molecules and is acquired from oxygen and carbon dioxide. It is obtained through leaves, and dissolved chemicals from soil water via the roots. The rest of the macronutrients are obtained from the soil. The ‘big three’ are nitrogen, phosphorus and potassium - often known as NPK fertilisers (from their elemental symbols, the K for potassium comes from its Latin name kalium). Nitrogen (N) Nitrogen compounds make up a large part of plant tissues, particularly amino acids, which make up proteins. Nitrogen is also an essential component of chlorophyll. Chlorophyll absorbs light for photosynthesis. Nitrogen makes up nearly 80% of air but is generally unavailable to plants in this form, instead it has to be provided in the soil ‘fixed’ (combined) with other elements in the form of nitrate (NO3-) or ammonium (NH4+) ions. The weathering of rock releases these so slowly that plants rely on microorganisms in the soil to make nitrogen available to them. Bacteria and fungi convert nitrogen in organic matter which plants cannot access back into ammonium (NH4+) in a process called ammonification. 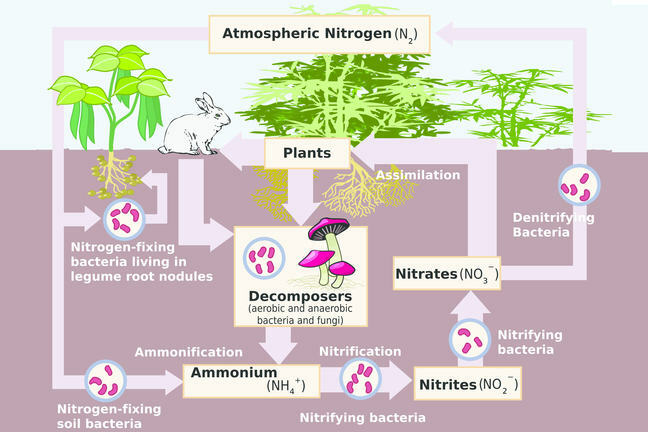 Ammonium is then converted into nitrate (NO3-) and nitrite (NO2-) by Nitrobacter and Nitrosomonas bacteria in a process called nitrification. Nitrogen deficiency most often results in stunted growth, slow growth, and yellowing (chlorosis). Legumes, plants from the pea family, are a special case. The roots of these plants have nodules containing symbiotic bacteria called Rhizobia which can fix nitrogen from the air into a form the plants can use. Legumes are often used in crop rotations to increase the amount of nitrogen in the soil. In the early 20th Century an artificial nitrogen fixation process called the Haber-Bosch process was developed and since then artificial fertilisers and other nitrogen compounds, such as explosives, are produced on an industrial scale. This dramatically increased the amount of food that was produced but also led to soil degradation and pollution from fertiliser run-off. Phosphorus (P) Phosphorus is a major structural component of DNA and adenosine triphosphate (ATP) – a complex chemical essential for the transport of energy in all living things. Phosphorus is highly reactive and is often limited to plants because it is slow to be released from rocks and is rapidly bonded into forms plants cannot access. Many plants make symbiotic relationships with mycorrhizal fungi to increase phosphorus uptake. Phosphorus deficiency causes intense green colouration or reddening in leaves. A high phosphorus content fertiliser, such as bone meal, is used to increase phosphorus content. Like nitrogen, over-use of phosphorus fertilisers is a major source of water pollution. Potassium (K) Unlike the other major elements, potassium is not involved in metabolism but is involved in forming carbohydrates and proteins, contributing to photosynthesis and regulating internal moisture by opening and closing gas exchange pores (stomata). Potassium deficiency may cause yellowing between leaf veins, stunted growth and dieback. Potassium is particularly important for fruit formation with high potassium soils producing larger, better-coloured fruits with a higher sugar concentration. Potassium fertilisers are called potash because they were originally made by soaking wood ash in a pot and evaporating to leave a white residue. Today most commercial potash is mined from evaporite deposits below the earth’s surface; there are only small amounts in manure. Sulphur (S) Is used in some amino acids and vitamins and is essential for photosynthesis. It is also needed for nitrogen fixation in legumes and conversion of nitrogen into amino acids then protein. Deficiency signs including yellowing of the leaves and stunted growth. Calcium (Ca) Regulates movement of other nutrients into plants and is involved in photosynthesis. Calcium deficiency causes stunting and curling of the leaves; roots are usually affected first. High concentrations of calcium are related to soil with a high pH. Magnesium (Mg) Is a major part of chlorophyll so essential for photosynthesis, symptoms of deficiency are similar to potassium deficiency.